ITALY'S SECRET PLACES: COMING ON MARCH 23, 2019! 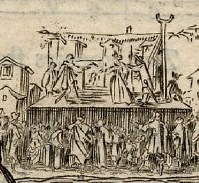 Florence, in 1614, during the Carnival season. The story unfolds—scene after scene--in the course of a single day. A world première, no less! This rollicking comedy— with a Jew in the title role—was written for the Carnival of 1614 at the Medici Court, by Michelangelo Buonarroti the Younger (great-nephew, heir and namesake of the celebrated painter, sculptor and architect). “Think Molière,” says Tony Gallo (’93), who is directing the staged reading, “but better!” Buonarroti (1568-1646) and Moliere (1622-73) were both intrigued by the Italian commedia dell’arte, with its manic energy, exaggerated characters and preposterous conflicts. But what is a Jew doing in the midst of this comic mayhem—especially a Turkish Jew named Melchisedec (“King of the Righteous”), with a turban, a long robe and a hennaed beard? Edward Goldberg is a Washington native with a Ph.D. from Oxford. For most of the last forty years, he has lived in Florence, exploring public and private archives. Along the way, he published various books and articles, including Jews and Magic in Medici Florence and A Jew at the Medici Court (both University of Toronto Press, 2011). What about Michelangelo the Younger’s play, L’Ebreo (The Jew)? Goldberg discovered the autograph manuscript in the Casa Buonarroti, that family’s historic palazzo, only a few blocks from his own home. In scene after raucous scene, we see Melchisedec—a classic Levantino (Jew from the East)—surrounded by boisterous characters from the commedia dell’arte: impetuous young lovers, overbearing elders, riotous servants and gossipy neighbors, plus a pompous lawyer and a scheming marriage broker. We watch them trip over each other’s feet in the mad whirl of the Florentine Carnival, the annual silly season between Epiphany (Twelfth Night) and Lent. Brilliant and lively, richly evocative of Late Renaissance Florence, L’Ebreo (The Jew) seems like a guaranteed hit. So, why did it have to wait four hundred years for its début on the world stage? With L’Ebreo (The Jew), Goldberg faced a triple challenge. First he had to retrieve the author’s own words. Next, he needed to delve beneath layers of revision to reveal the play’s dramatic core. Only then could he shape this material into a performable script—in English—while preserving the sound and sense of the original.